One summer we rented a home in Pont-Aven. This Brittany village is where Gauguin painted off and on between 1886 and 1890. The pension in which he held forth with Emile Bernard and Paul Serusier is now a news-agency. The section of town where we stayed was called quatre-vents — four winds. Every day, water-laden clouds from the Atlantic blew across my canvasses. Much has been made of the light in France and other places in Europe. “Pellucid” and “diffused” are words often used. When a strong and clear light is combined with a moist atmosphere the effect of aerial perspective is enhanced. From the quay in Pont-Aven, the other side of the river, barely a few hundred yards away, often appeared abnormally distant. Pont-Aven was a summer workshop in the use of cooler and bluer tones, softening and obscuring edges for the illusion of depth. A change from the convention of Nordic art, which I grew up with, where distant elements are often socked in full strength to carry the design and pattern to the back of the painting. 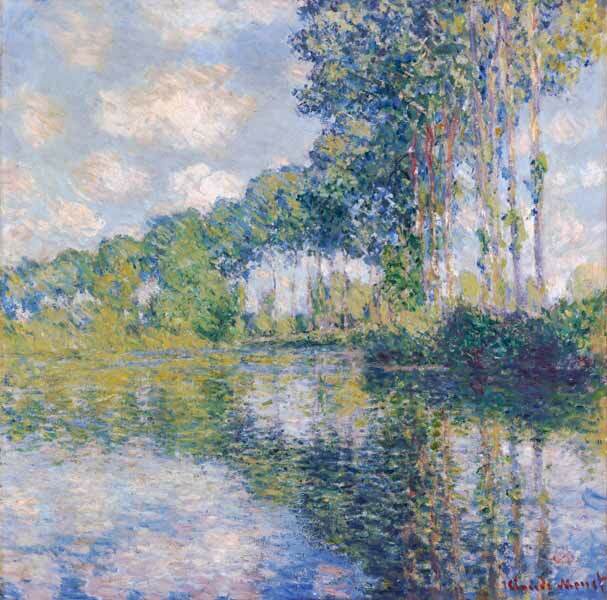 It’s no wonder that impressionism took its first spin in France — one always seems to be looking “through” something. As I sat painting on the quay a man wearing wooden shoes pointed to a house on the other shore which I had included in my painting. He told me that his ancestors had lived there since the last century. I asked him if any of his ancestors might have mentioned seeing Gauguin or Bernard or Serusier painting anywhere around here. He replied that they might have — but he had never heard of them. Then he asked politely if those gentlemen I mentioned were relatives of mine. Esoterica: Apart from the use of linear perspective, elements can be forced back in the picture plane by cooling and graying. High key cobalt blue and purple-tinted pthalo are useful for the purpose. Often, just cruising for hard darks in the offskip and knocking them down does the trick. The following are selected correspondence relating to the above letter. If you find value in any of this please feel free to copy to a friend or fellow artist. We have no other motivation than to give creative people an opportunity to share ideas and possibly broaden their capabilities Thank-you for writing. (RG note) Several artists asked what this word means. It’s a localized and somewhat obsolete English word used by painters, mostly in the 19th century, to describe the background or distance in a scene or a painting. The opposite of foreground. I am a student in a University College in my second year of a 2 year diploma in Fine Arts. I have not heard of the term “aerial perspective” or if I have it didn’t stick or I was out of the room. While I don’t think I need to know about this for the art I will be doing it was good to hear about it and I now know it exists. Incidentally, you explained it very well. Pont-Aven today is crawling with artists. The French like to go there and buy prints that commemorate what is called the “School of Pont-Aven.” Some originals too. The famous “Bois de Amour,” a lovely walk along the river Aven is nearby where it is possible to be alone and get the feeling of the old times. The strong, crisp, clear light of Canada is what the Group of Seven painted and it wasn’t immediately understood. Aerial perspective was achieved through colour and design, which I think is much more difficult. The misty landscapes of Europe were the accepted norm when the Group of Seven broke with tradition. My daughter Laura took her 4-year-old daughter to see the Van Gogh exhibit in Atlanta this past weekend. Lindsey called me all excited to tell me about her favorite Starry Night and share the tidbits she remembered about this artist. She tells everyone she wants to be a painter like “Nanna” when she grows up. When I told her I would teach her to paint, she replied “But I already KNOW how to paint.” Another born artist. I forwarded a copy of your letter and the Van Gogh website to Laura to share with the little one. She has visited Arles and is quite a fan of Van Gogh. The painting is larger in life than expected and wonderful. Chinese painters made atmospheric recession occur in landscapes by interposing mists and clouds in progressively weaker tones. This was often based on the progression of hills and mountains that are prevalent in some parts of China. Gradations based on the fact that the atmosphere is usually denser as it nears the horizon have a similar effect. It’s a spatial illusion. I’m sorry to say that these days industrial pollution has an effect on some environments, making elements recede more than they would under the effects of nature. The essential problem with the inclusion of aerial perspective in a painting is that it leaves no easy way for the eye to return to the foreground. This was noticed early on and the result is that most modern art does not utilize the phenomenon. Bourgeois art may invite the viewer to enter into the painting, lose itself somewhere in there, and hold it with fuzzy mystery and wonder. It is now often thought that this is not enough and that it is only an artifice. People say wonderful things when I am out there painting. “Why are you doing this?” and “Do you work from photographs?” and “Have you ever sold one of these things?” are three that come to mind. The New York Institute of Photography’s ongoing examination of Vincent Van Gogh as influence to art and photography. You may be interested to know that artists from 74 countries have visited these sites since June 1, 2000. And also Ann Marie and Ron Tout of Norman Wells in Canada’s Northwest Territories who just got back from Greece: plus 30 to minus 4 Celsius. Researchers and artists seeking inspiration can check out the ever expanding Resource of Art Quotations.